Dental care is something that is needed on a universal level and at every age. We do not think that dental care should be specifically made for just one age group. That is why Dr. Jayson C. Haws provides pediatric dentistry in Brigham City, Utah. We understand that each of our patients at their various age groups and backgrounds have specific needs. ​​​​​​​We work hard to make sure we meet all of your needs, that your children feel happy and comfortable in our office, and that we can provide great care and excellent service to our patients of all ages. Your children will feel safe and comfortable in our practice, and we will make sure to take care of you and your family. Your child’s first dental appointment will be short and will not involve much treatment. 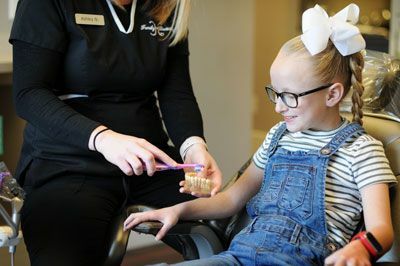 The purpose of this visit is to give your child the opportunity to meet our dentist in a friendly, non-intimidating way. We want to help your child feel comfortable in the dental chair. Our dentist may ask you to sit in the dental chair with your child during their dental exam to help them feel comfortable. Feel free to contact Haws Family Dentistry today to learn more and to schedule your child’s next visit.